Tulips are admired the world over for their spring display of showy, individualistic flowers. These flowers are easy to grow in pots and containers, allowing these solitary beauties to be displayed in areas other than the garden plot. Some gardeners can enjoy a continuous display of new tulip blooms by forcing the bulbs to flower in pots. Snip your tulip flower at the base of its stem once the bloom begins to wilt. This saves energy that would have been spent producing seeds to be stored in the bulb for new growth and next year's flowers. Gently tug the leaves and other greenery away from the bulb only after it has turned completely yellow or brown, as the foliage is what feeds the underground bulb through the growing season. Dig up your potted tulip bulbs to either refresh the soil or move them to new or larger pots. It is at this point that you can separate smaller bulbs to either plant farther away from the main bulb in the same pot or place in their own pots go grow on their own. Store your tulip bulbs in a cool, dark and dry place until the next planting season. Plant your tulip bulbs sometime during September or October in fresh soil either in the old pot from last year or a bigger, taller pot to allow for new growth. Bulb tops should be about 5 to 6 inches below the soil's surface, spaced between four and six inches apart, and water them once thoroughly. Place your repotted tulips in a sunny spot in your garden or an east- or south-facing window for the biggest, brightest blooms next spring. Care for your repotted tulip bulbs through the winter and blooming season. While a single watering would usually suffice for tulip bulbs planted in the ground, potted flowers will need regular watering through the winter, especially in the weeks following planting, as containers don't retain water as well as soil does. 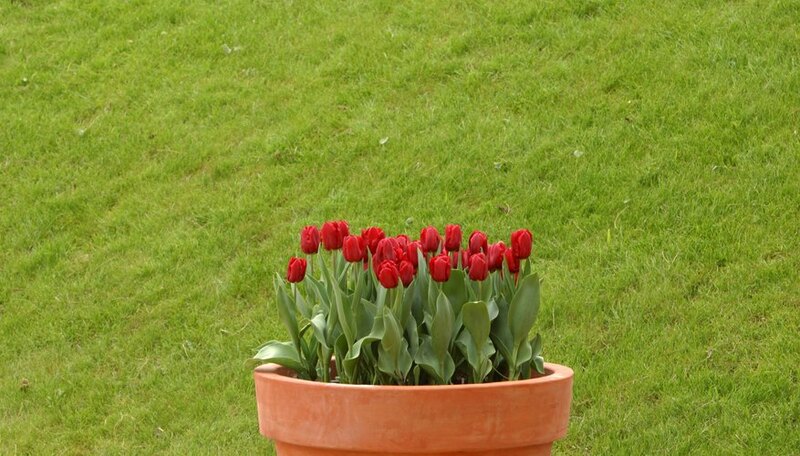 Feed your potted tulip once it begins to bloom, and remove dead flower heads as they fade through spring. Stop watering your potted tulips when the foliage begins to turn yellow to allow the bulbs to dry out properly. Plant multiple bulbs in your pot, if space allows, for a more dramatic spring display. Separating potted tulip bulbs while they are still in bloom will kill your flowers.